December 15, 2011: The Knife Bigots on the Boston City Council on Wednesday approved an anti-knife ordinance that licenses retailers of knives with a blade 2 inches or longer. A revision of the original proposal exempts “cutlery” that is defined as “utensils used as tableware or used for cutting and eating foods.” Regardless, this ordinance is still flawed in many respects,beyond the fact that it will be ineffective at its stated aim of reducing crime. Knife rights still opposes this ordinance as unneeded, irrational and likely, illegal. You can read the ordinance here: http://bit.ly/vFD3Sy and the committee’s report and intellectually dishonest rationalization for the ordinance here: http://bit.ly/uiyF0L. 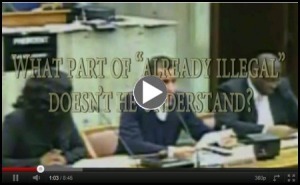 November 23, 2011: The hearing today in Boston on the proposed anti-knife ordinance was a total farce. We’ve coined the term “knife bigots” to describe these councilors, and others, who simply hate our freedom and our tools and staged this farciful hearing as part of their effort to railroad through this ordinance. The only councilors at the hearing were the ordinance’s sponsors. To spare you the agony of listening to the entire hour and 49-minute long low-quality video, we’ve put together an “entertaining” summary video with highlights and some commentary. This should give you some insight into their skewed view of knives and our rights. Click here or the image below to view the video. This is how they view knives overseas and why we formed Knife Rights to prevent this from happening in America. This is the Anti’s vision for knife owners in America, if we do not oppose them at every turn. Watch the video and hear some of their more outrageous comments, such as, “No law is too onerous…when it comes to the sale of these weapons.” At one point, Councilor Michael Ross appears to be encouraging lawsuits against knife manufacturers for the illegal knife sales made by some convenience stores. Todd Rathner, Knife Rights Legislative Director, led off the testimony opposing the ordinance, with supporting testimony from Jim Wallace of Gun Owner’s Action League (GOAL), the NRA’s Massachusetts affiliate, and a statement from American Knife & Tool Institute read by an AKTI representative. You can read Knife Rights’ official submitted testimony at www.KnifeRights.org/Boston_Statement_11-18-2011.pdf. Todd’s actual testimony was somewhat different as he responded to the preceding testimony by the Councilors and their witnesses. The proposed Boston ordinance “PROVIDING FOR THE LICENSING OF STORES THAT SELL CERTAIN KNIVES” has been presented to the city council. If you are a Boston citizen, please contact your Councillor IMMEDIATELY and POLITELY express your opposition to this unnecessary and discriminatory proposal: www.cityofboston.gov/citycouncil/councillors or you can call 617-635-4500 and ask for your Councillor. Additionally, you can email Mayor Tom Mennio at mayor@cityofboston.gov or call his office at 617-635-4500. We might wish it were just a silly Halloween prank, but these politicians are serious, and that makes it a scary issue. This proposal to license so-called “convenience stores” in order to be able to sell knives two-inches and longer doesn’t accomplish anything but to cost businesses additional hassle and money, which might well succeed in their ultimate goal of making it impossible for law-abiding citizens to buy a knife at their local convenience store. That is discriminatory against both citizens and these businesses. These businesses may well decide it is too much trouble and expense to bother with knives anymore, which is obviously what these politicians want. But, this will not make a dent in crime or violence, their supposed excuse for this stupidity. This proposal is wrong on so many levels. You can review the poorly conceived and drafted proposed ordinance here: www.kniferights.org/BostonOrdinance.pdf. Try not to choke upon reading it. Click here to read a report on the original hearing on this proposal. You can pretty much guarantee that when politicians are talking about blaming inanimate objects for crime, that it is only the honest citizens and businesses that will be impacted by their proposed solution. Nobody wanting a knife will have much difficulty buying one someplace else, either at non-convenience (inconvenient?) stores, because most other stores except ill-defined “convenience” stores are exempted from this licensing (or perhaps not), or via the internet or from a somewhat less convenient convenience store across the city line. I recall living in a dry town some years ago. It was easy to find the town line; you just looked for the liquor stores with the big parking lots. No matter what these politicians do, they cannot and will not stop knives from being sold to those who might use them in criminal activity and no regulation of knife sales will stop violence. Boston code already restricts sales of knives over two-inches long to minors and these, like all retailers, already must be licensed to do business in the city. Knife Rights continues to lead the fight against this absurd and unnecessary proposal. Our lobbyist is working hard to prevent what has happened with guns in Boston to be repeated with knives. When Knife Rights stands up against an anti-knife proposal like this, even if it is not in your backyard, we need your support because if we lose, then we all lose, and when we win, we all win. No matter the result, the other side has to understand there will be no more easy rides when they try to take away our knives and our rights. Standing up for our rights does not come free, please consider donating to help pay for this effort. We need your donations and we need your voice to be heard by the Mayor and City Council of Boston.